We started Atma Connect to build resilience in low-income urban communities. Founded in 2014 and based in Oakland, California, we are a nonprofit technology company that creates solutions to empower users. We envision a world where neighbors help neighbors prepare for disasters, improve access to basic needs, and overcome chronic challenges. We view vulnerable people not as objects, but as agents in change. We launched AtmaGo as a neighborhood-level social network app in Indonesia in 2015. In thousands of posts and replies, AtmaGo users are sharing real-time information about fires, floods and crime—and offering advice and solutions about jobs, education and health. Many technology programs in the developing world are geared towards collecting information from the users or telling them what to do. Atma Connect believes in a fundamentally different approach: using technology to help people help each other by sharing solutions, taking collective action, and building community resilience. Our goal is to scale AtmaGo to connect and empower billions of underprivileged people in every region of the world so they can improve their communities from the ground up. 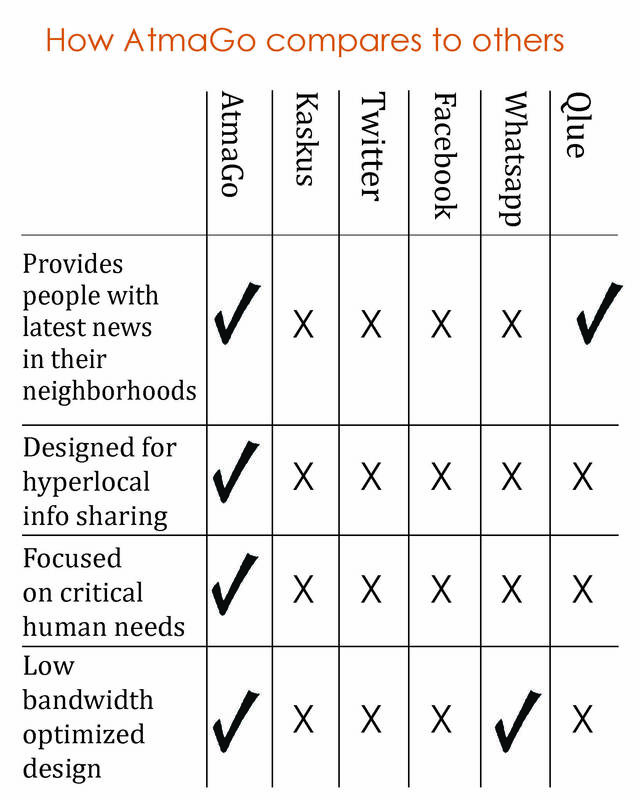 AtmaGo solves the place-based needs of communities better than other social apps like Facebook, Twitter or WhatsApp because the content is geographically organized and useful. Our users have told us that they trust AtmaGo more than government apps like Qlue and Lapor because the content is community generated. Our strategic advantage is hyper local, user-generated content focused on people helping people. AtmaGo is unique because it works on all kinds of phones and requires very little bandwidth. Because users engage with each other daily around basic needs and challenges, they rely on and trust the information on AtmaGo, knowing that it comes from their own community. People are far more likely to survive serious disasters and address chronic vulnerabilities when they have good social networks and connections. AtmaGo first launched as a way for people to share water prices, but users told us they wanted to share more information than just water prices locally—so we completely changed course and launched a new version. If you are passionate about our technology, we would love to hear from you! There are no job openings at this time. If you have general interest, please email us at atma@atmaconnect.org.